February 1, 2018, New York, NY – The Misdemeanor Justice Project (MJP) at John Jay College of Criminal Justice today released a report that documents striking changes in misdemeanor arrest patterns in New York City over a period of 24 years. The study, Trends in Arrests for Misdemeanor Charges in New York City, 1993-2016, offers an in-depth look at the number and rate of specific charges by demographic groups and borough. The researchers identified increases in arrest charges that are most likely to be complaint-driven such as victim-related person and property charges in comparison to dramatic fluctuations among charges that are less likely to be complaint-driven, and are more likely to be officer-initiated, such as theft of services, marijuana, and other drug charges. This report also examined seven other individual charge categories such as trespassing and prostitution. “New York City has seen enormous changes in specific charges categories for misdemeanor arrests. This report highlights the need to disaggregate trends by charges and the importance of using population estimates to examine changes among demographic groups,” said Professor Preeti Chauhan, principal investigator of MJP. Although misdemeanor arrests almost doubled from 1993 to 2010, arrests for specific misdemeanor charges followed distinctive patterns. The key findings of the report, presented this morning at a forum sponsored by the Citizens Crime Commission of New York City, are as follows. From 1993 to 2014, the number of arrests that were more likely to be officer-initiated was higher than complaint-driven arrests. In 2015 and 2016, the number of arrests that were more likely to be complaint-driven exceeded the number of arrests that were more likely to be officer-initiated. For all demographic groups, complaint-driven arrests were higher in 2016, relative to 1993. For all demographic groups, the number of officer-initiated demonstrated fluctuations and this was more pronounced for men, Blacks, and younger age groups. Over the course of the study period, younger people (16-20 year-olds) had higher arrest rates for marijuana and victim-related property charges relative to the oldest age group (35-65 year olds). The older age groups (25-65 year-olds) had higher arrest rates for drugs other than marijuana charges relative to the youngest age groups (16-20 year-olds). 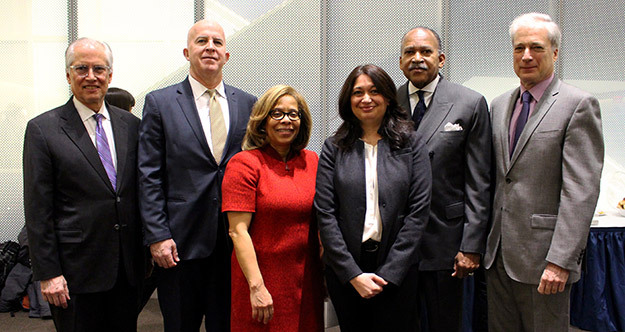 L-R: Executive Vice President Jeremy Travis, Laura and John Arnold Foundation; New York City Police Commissioner James P. O&#39;Neill; John Jay College President Karol V. Mason; Professor and MJP Principal Investigator Preeti Chauhan; First Deputy New York City Police Commissioner Benjamin Tucker; President of the Citizens Crime Commission of New York City Richard M. Aborn. The complete data analyses are documented in a full report that is available here. With funding by the Laura and John Arnold Foundation, this is the seventh report prepared by the Misdemeanor Justice Project, a research initiative at John Jay College headed by Professor Chauhan that includes faculty, graduate students and staff. Previous MJP reports have focused on trends in police enforcement practices and trends in corrections including pretrial detention. All reports are part of a series released with the Citizens Crime Commission. To access the MJP reports, please visit the website at www.jjay.cuny.edu/mjp.